If you are looking to make reservations for an event venue in Atlanta, GA, Cuts Steakhouse offers a variety of group menus for you to host any event. Please complete the form at the bottom of this page and our event coordinator will contact you. If you have questions about events or groups of less than 12 please contact us at 404.525.3399. 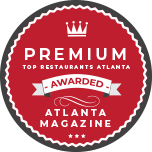 This steakhouse in Atlanta specializes in southern cuisine and hospitality so make a reservation for your group, today, and enjoy the experience. Whether you’re celebrating a special occasion, holding a work meeting, or simply gathering with friends or family you haven’t seen in a while, our venue can accommodate your needs. You and your guests can enjoy delicious steaks and Southern food in Atlanta in one of our private or semi-private dining rooms or allow us to come to your location to provide comprehensive catering services. Our event venue offers plenty of convenience and class for you and your guests. We’re located in the heart of downtown Atlanta, so you can plan your event to coincide with a trip to the nearby aquarium or zoo, watching a graduation ceremony at Georgia State University, or a corporate meeting at one of the many nearby hotels. No matter where you’re coming from or heading to, we’re here to make sure you have a great time in our city. With premium aged steaks in Atlanta, upscale Southern food favorites, and a vast assortment of wines available for you and your guests to enjoy, we’re the ideal venue for any event you’re planning. Reach out to our coordinator if you’re planning an event for more than a dozen people. We’ll make sure you have the space, privacy, and menus you need to make sure all your guests are cared for. Contact us at 404.525.3399 to schedule events for groups of more than 12 people. 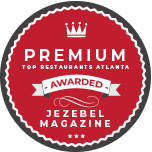 We are proudly located in Atlanta, Georgia.